With 3:32 to play in the third quarter of Wednesday's Clackamas-Southridge Class 6A girls' basketball quarterfinal, it was still anybody's ball game. How many teams have stepped on the floor against Southridge and said that this season? Yet here was Clackamas, putting some serious heat on the defending state champion Skyhawks of Beaverton. And is wasn't a case where the Cavaliers were still within striking distance midway through the third quarter. They were playing solid defense, they were holding their own in the rebounds department, their press-break was working, and they had the lead. OSAA Class 6A girls' basketball tournament opener at the Chiles Center. Maya Hoff added 10 points and Cameron Brink finished with nine points and 14 rebounds to help send the top-ranked Skyhawks (25-1) into Friday's 1:30 p.m. semifinal against West Linn (23-3). Clackamas' Elly Bankofier, Kalani Hayes, and Bri Phiakhamngon scored nine points each, and Savannah Duarte added eight points and four rebounds as the Cavaliers (23-3) were relegated to Thursday's 9 a.m. consolation game against North Medford (18-8). "It's disappointing to see it end the way it did, but it was a good game," said Phiakhamngon, the Cavs' senior point guard. "We played hard in the first half, but after that, Southridge did a really good job adjusting on offense and I just feel our energy went down and that's what killed us the most." Clackamas dominated the first quarter and jumped out to a 15-5 lead after holding Southridge to 1-for-10 shooting from the field. The Cavaliers did an outstanding job of limiting the touches that Maggie Freeman and Brink had for the Skyhawks, but the key sequence came in the final 30 seconds when Phiakhamngon knocked down a 3-pointer for Clackamas, McKelle Meek missed a trey at the other end, and then Phiakhamngon banked in a 3 at the buzzer. "That was very exciting," Cavaliers coach Korey Landolt said. "But not overly exciting, because we know the type of team Southridge is and the type of runs they they can put together." The second quarter was almost all Southridge. After Bankofier made two free throws -- Clackamas' only points of the quarter -- to give the Cavs a 17-8 lead, the Skyhawks went on a 9-0 run over the final 3:05 to climb into a 17-17 tie at the break. Clackamas scored the first four points of the third quarter to regain the lead, Southridge got the next six to go on top, and then Hayes connected from beyond the arc to give the Cavaliers a 24-23 lead with 3:32 left. "It felt nice to be in a position where the spread wasn't so immense that we couldn't come back or anything," Landolt said. "I didn't necessarily feel like we were in the driver's seat by any means, because there were so many momentum shifts, but at least we were still in the game." Southridge got a basket from Blair and two free throws from Freeman to regain a 27-24 lead, but Olivia Morris answered with a 3-pointer for Clackamas that tied it at 27-all with 1:48 left in the third quarter. Then came the run that decided the game -- a 20-4 outburst that started with Blair converting a three-point play with 1:22 left in the third quarter and ended with Blair scoring to the Skyhawks a 47-31 lead with 4:26 to play in the fourth. 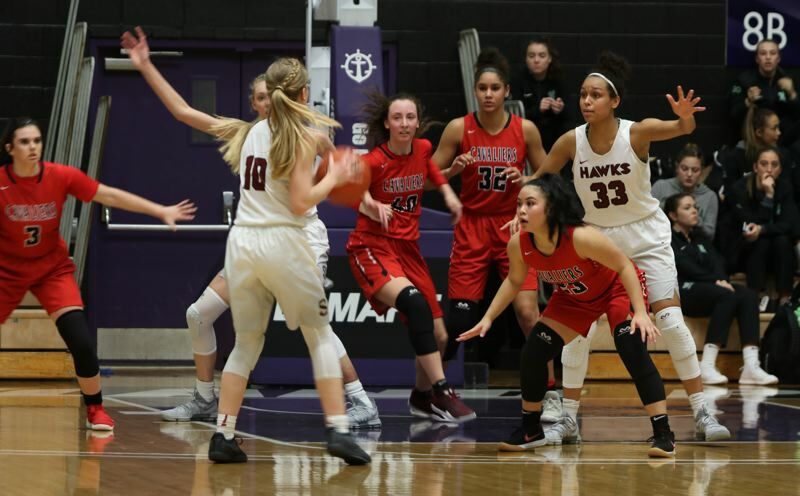 "Clackamas ran a box-and-one defense, which we had to make an adjustment to, but I think our girls did that," Skyhawks coach Michael Bergmann said. "It feels weird when you're wide open and not making shots, but I was really proud of our starters and our bench kids. They didn't back down. They just kept right on attacking." The Cavaliers contributed to their own demise, going 1 for 5 from the field with three turnovers during the five-minute stretch when they went from being tied to trailing by 16. "I felt we executed our game plan really well early on," Landolt said. "There were some moments and some runs that Sourthridge went on that we had a hard time slowing down, and then we got a little bit sloppy with the ball offensively for a few minutes where it was kind of helter skelter. "It's kind of demoralizing when you have a turnover and they come down and score on a lay-up, and then you come down and you make a bad pass again and they come down and get another lay-up with a foul. That's like a dagger to the heart. Those types of runs are hard to weather when it's late in the third quarter and middle of the fourth." Clackamas shot 47.2 percent (17 for 36) from the field and 50 percent (5 for 10) from 3-point range, while Southridge shots 35.4 percent (17 for 48) from the floor and 33.3 percent (5 for 15) from long range. The difference on the score board was reflected at the free-throw line where the Cavaliers went 3 for 6 and the Skyhawks went 18 for 30. "The game didn't go the way we wanted, but we still played as hard as we could," said Morris, the Cavs' reserve guard. "We're sad with the result, but we're happy with the way we played and the heart that we showed. "We played pretty tight to our game plan. The first three quarters, we executed for the most part what we really wanted to do. The last quarter, the game got away from us, but we still played our hearts out, no matter what."